Mom, the Intern: Giveaway: Hello, Sweet Love stamped jewelry! Giveaway: Hello, Sweet Love stamped jewelry! GIVEAWAY CLOSED -- WINNER ANNOUNCED BELOW! I've told you before I love Valentine's Day (I know that makes me crazy-chick material to some of you) and it's true; I do! Red and pink, cute hearts everywhere, chocolate, lurrrrve ... what's not to enjoy about February 14? Today, I want to focus on the love aspect of Valentine's Day. Specifically, charity and service. Because that's what this giveaway is all about. "Our goal ... is two things. One, to sell beautiful handmade jewelry designed by you at prices that you will love. 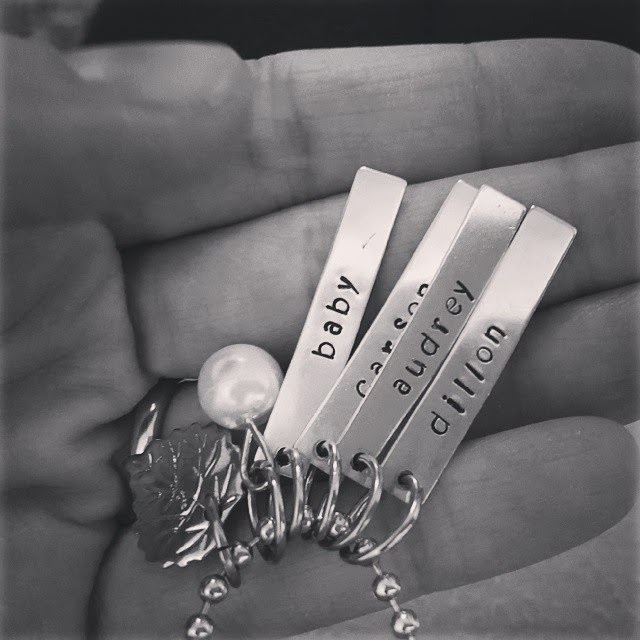 I have for years wanted a necklace with my children's names on it. I Googled and Googled and tried to find something I could afford on a law school budget (HA!) and was so sad at what I was seeing. So we are offering beautiful jewelry that anyone can afford. So now, I have my necklace and I love it. "Secondly, why not give back if we can? As previously posted, we mentioned that we would be sponsoring people that are nominated by people that read our blog. What we do is we design a piece of jewelry specific to the recipient's situation and sell it, giving more that 50 percent of the profits to them!" This customizable antique heart pendant is 1.5" and comes on a 23" chain. It is accompanied by a small red bead that is perfect for Valentine's Day. Enter the giveaway using the Rafflecopter widget below! You MUST Follow my blog with Bloglovin, like my Page on Facebook OR subscribe to me on Google+ to be eligible. Winner will be announced on V-day! I love the single circle "happy in love" necklace. :) So cute. Oh, I love the name bars. I love being able to wear Kale's name around my neck, and would love to add my other kids! I like the single circle. Simple and lovely. The name bars necklace is my favorite! I love the "Fierce" stacked circles or the Customizable Antique Heart. So cute! The stacked circles was lovely. I love this!!! If I win I will give it to my daughter. My dad just died on January 28 and he gave my grandddaughter, his great-granddaughter, a book called I will Love you Forever, I will like you for always as long as I'm living my baby you will be. Aww I kinda love everything! Love the customizable antique heart necklace. It's so pretty and I'd wear it every day! I love the leather cuff! The Love You Forever Necklace is a beautiful piece of jewelry! My favorite is the customizable antique heart necklace. I would get my sons name on it. I hope that I win. I love the leather cuff! Love the leather heart cuff. I love so many things! I love the charm bracelet. I hope I win! This is so great! I love leather cuffs, but I'm digging this necklace. Love the name bars necklace!